Ginger, with its spicy, warm aroma and taste, is most frequently associated with South East Asian cuisines, although it is now more widely consumed than ever. Rich in a number of essential nutrients, ginger also has several health benefits, especially for your digestive system. Crystallized ginger, also known as candied ginger, is made by boiling ginger in a simple syrup and then letting the candy dry out. While the health benefits of ginger are preserved, the sugar content is greatly increased. 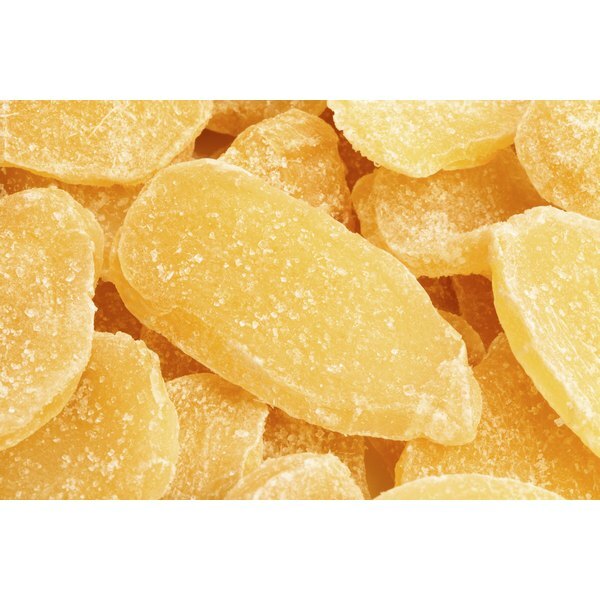 Pay attention to your consumption of candied ginger to avoid getting too much sugar. If you get motion sickness, eating crystallized ginger, or eating some ginger chews can help alleviate the symptoms. Ginger naturally helps prevent nausea, especially when it results from dizziness or motion sickness. If you have motion sickness regularly, try one or two small to medium-sized pieces of crystallized ginger before or during travel. In addition to nausea from motion sickness, crystallized ginger can also help with nausea and upset stomachs resulting from morning sickness. Morning sickness is no fun to deal with, and the same amount of ginger per day, one to two small to medium-sized pieces, may help reduce the vomiting or nausea that comes with pregnancy. If you have extreme morning sickness, or experience it over a prolonged period of time, speak with a medical professional as there may be other factors at play. Consuming ginger every day or on a regular basis can help reduce muscle pain from exercise related effort or injury. In a 2010 study published in the "Journal of Pain," ginger was shown to help relieve some muscle pain due to exercise. A daily dose of 2 grams of ginger reduced pain and inflammation due to exercising. Ginger can also help reduce inflammation of the joints, which may be helpful also in treating conditions such as arthritis, according to the University of Maryland Medical Center. For over 5,000 years, ginger has been prized and used for its "warming" properties. In Asian medical practice, historically and in the current-day, ginger is used to treat a number of conditions, from arthritis and migraines, to sore throats. It is also used as a general health tonic, thought to help reduce overall body fat and improve circulation. In Ayurvedic medicine, the traditional medical practice of India, ginger has been used in the treatment of anorexia and cholera. What Are the Treatments for Excessive Coughing? How Many Calories Are in McDonald's Apple Pies?